Some months ago Dartington Arts asked me to be their Artist in Residence on the beautiful Dartington Hall Estate here in Devon. Today I picked up the keys to what is a stunning space in the old Aller Park School building. Aller Park has been largely empty since around 1998 and is in poor shape… but….us artists are great colonisers and I have agreed to be their ‘guinea pig’, their ‘feasibility study’ for what we hope will be a very exciting venture going forward to bring the huge old building back to life as artists’ studios and exhibitions space. 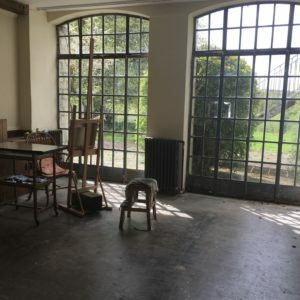 A home for the fine arts at Dartington to sit alongside the Craft Revolution and the wonderful exploratory and participatory work with hard-to-reach groups that happens in the ArtLab at SPACE. Eventually the hope is for the visual arts to match the already established, world-class programme of music, poetry and performance that is so highly valued and loved by locals and visitors alike.